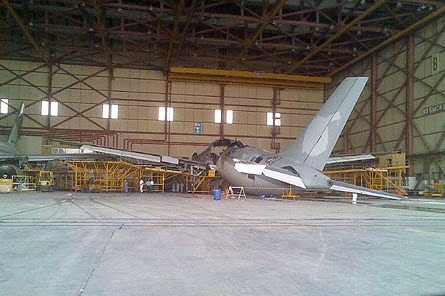 First images from the scene of the Gulf Aircraft Maintenance (Gamco) hangar fire in Abu Dhabi confirm that the aircraft at the centre of the blaze, a Qatar Airways Airbus A300-600, has been completely destroyed. Information emerging from Abu Dhabi shows that the fire, initially claimed to have been brief and contained, was far worse than authorities had been prepared to admit. Almost the entire upper fuselage, from just behind the wing box to a point aft of the flight deck, has been burned through to the crown. 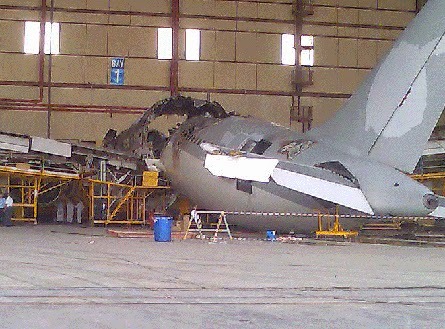 Structural failure has resulted in the empennage of the A300 dropping to the hangar floor. A Gamco source says the whole cabin has been gutted by the blaze and claims that the fire took between one and two hours to extinguish – adding that, although there were no fatalities, an engineer was seriously hurt after jumping from the A300. Images obtained by FlightGlobal show that authorities have attempted to de-identify the jet by painting over the Qatar Airways logo on the tail fin.